Alabamas First District congressional seat candidate Bradley Byrne greets supporters Tuesday, Sept. 24, 2013, at Ed's Seafood Shed in Spanish Fort, Ala.
Will it be ruin or resurgence for the Tea Party in Alabama race? There’s a war raging between establishment and movement conservatives for the soul of the Republican Party. The next battlefield is at the ballot box in less than two weeks in a rural South Alabama district. The proxy fight is a special primary runoff in the state’s 1st Congressional District, where establishment-backed Bradley Byrne and Tea Party insurgent Dean Young are vying to succeed former GOP Rep. Jo Bonner, who resigned from Congress in August to take a job with the University of Alabama. The contest may show how harshly voters are–or aren’t–blaming the Tea Party for the shutdown, and whether the Republican establishment can–or can’t–successfully push back on the party’s extreme-right base. “It’s very much a microcosm of what you see nationally,” said Alabama political strategist David Mowery, who’s worked for candidates on both sides of the aisle. “If the establishment wins in South Alabama in a special election, the Tea Party is in serious, serious trouble,” Young told NBC. In this solidly Republican seat, where Obama won only 37% of the vote in 2012, whoever wins the November 5 runoff will be heavily favored to win the December 17 general election. A former state senator and chancellor of the state’s community college board, Byrne won praise for reforming the two-year system after it was plagued with corruption issues. Byrne ran for governor in 2010 and finished atop the four-way field by three points, but lost in the runoff to now-Gov. Robert Bentley by 12 points. In that race three years ago, Bentley didn’t just paint Byrne as part of the GOP establishment, but brought up Byrne’s biggest political liability: his 1997 party switch from Democratic to Republican, after he had already won election to the State Board of Education as a Democrat. Young is appealing to a energized and deeply religious Tea Party crowd. His win could have national implications if he goes to Congress and joins the party’s defiant right wing. In what is expected to be a low-turnout election, intensity is often the most important factor–and one of the hardest to predict. That could mean trouble for the middle-of-the-road Byrne. “It’s the logic versus emotion appeal, and what’s going to win in the end is usually emotion,” said Buchanan, whose firm surveyed the primary and accurately gauged almost every candidate’s support in the September contest–but underestimated Young’s by about 10 points. “Dean definitely fires his people up, and in a special election that can be a very powerful force,” added Buchanan. Young has called gay marriage “a corruption which seeks to destroy the concept of the family.” He pressured his other primary opponents to sign a pledge that they would take steps in Congress to oppose gay marriage and support a change in the Alabama Republican Party bylaws to expel any member who favored gay marriage. Both rivals have been trying to recast the race in its final days–but it’s the mainstream Byrne who’s gone scorched earth against Young in a brutal new television ad, while the Tea Party candidate presents a soothing message of family and faith. Byrne’s new ad, now removed from his YouTube channel, accused Young of personally profiting from money he had helped raise for Moore and other conservative PACs. “What kind of person fools Christians for his own profit? Dean Young, the last guy we need in Washington,” the ad says. Young has vigorously refuted the ad, and says he’s handed over receipts to local media outlets to show all the money he raised went to campaign expenses. The underdog released his own ad this week too, but with a much softer sell designed to appeal to his core Christian conservative voters. “Dean Young was raised in poverty, dropping out of high school to help his family,” his wife, Jan, says as the camera scans the family photos that line their walls. Young knows the GOP establishment is uncomfortable with him and the wing he represents. “[My win] will send a loud message, and that’s why they really don’t want me to win,” he told NBC. “If you guys send me to Congress, it will be like sending Ted Cruz to Washington,” Young said in a Tuesday afternoon forum with Byrne. Young was opposed to the deal to reopen the government and raise the debt ceiling, saying Obamacare should be blocked at any cost. “If we have to shut down the government to do it, we will do it,” Young told NBC. By contrast, Byrne sounded ready to reach across the aisle. Byrne’s campaign tries to frame the two men as ideologically similar. But fresh off the government shutdown debacle, many mainstream Republican see it as a clear choice. And even with a significant money edge on Byrne’s side, they are clearly worried. On Monday, the Chamber of Commerce’s chief lobbyist Bruce Josten said his group was “probably actively interested” in engaging in the race to help Byrne, but hadn’t made a decision yet. Bonner has thrown his support behind Byrne too, along with the primary’s third and fourth place finishers who accounted for nearly 30% of the vote. Byrne also won the coveted endorsement of the National Rifle Association. While the GOP cavalry is riding in to protect Byrne, national Tea Party and conservative groups haven’t shown up for Young–and he’s clearly frustrated and puzzled by their absence. Club for Growth says they’re watching the race, and FreedomWorks hasn’t waded in. Another outside group, the Now or Never PAC, has polled the race, finding Byrne up by 7 points over Young, 44%-37%, with 19% still undecided. However, the NON-PAC, which aired last-minute ads for controversial GOP nominee Todd Akin in the Missouri Senate race, says they haven’t decided yet whether to jump in on Young’s behalf. Young’s most notable backer is Sharron Angle, the failed GOP nominee against Senate Majority Leader Harry Reid in 2010. Her Our Voice PAC has spent $14,000 on his behalf, airing ads in the primary; the group just bought a small amount of TV time last week, according to independent expenditure reports filed with the FEC. The tone of the campaign is increasingly personal–and hostile. 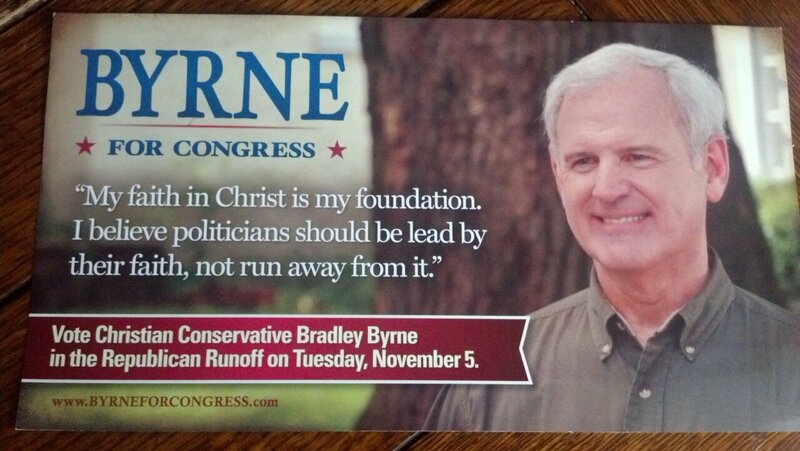 Byrne’s campaign is just as scathing about Young. Whichever man wins, the GOP divide could grow wider. The internal party war may not threaten this seat, this time–it’s probably a safe bet to stay Republican–but ultimately, the party will have to decide who its constituents are.